The first time you start your freshly installed Windows XP a blue screen will appear displaying a congratulation message (after all you deserve it: you’ve done nothing during a 45 minutes installation) before prompting you to create users’ accounts, register and activate the OS. During this preparation step, the wizard will display an animated character (you can choose different ones like Merlin, etc.) to assist you: this is the first time Microsoft uses its Agent technology in Windows. The wizard will try to detect your modem and set up your Internet connection. However this step is useless most of the time especially if you have an ADSL or cable modem since XP doesn’t include any native drivers. The modem and Internet setup step can be skipped and then you have to define the users’ accounts for the various people that may use the PC. Finally the wizard will offer you the chance to register and activate your copy of Windows XP. 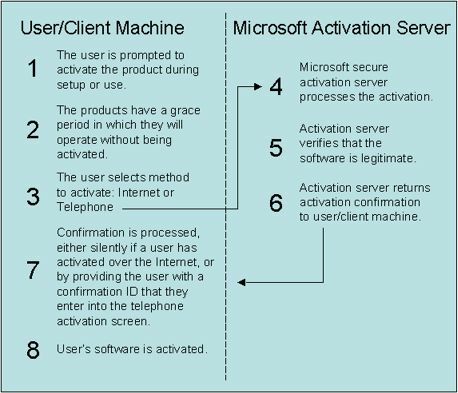 As you know, Microsoft Windows XP is the first operating system to feature the WPA (Windows Product Activation) technology. The activation process is supposed to reduce piracy since the activation will create an unique ID for your machine (based on a savant combination of the hardware you have) that matches your product key. That way, Windows XP will only work with your computer. It’ll be locked if you install it on another computer thus ensuring the strict respect of the licensing terms. You have 30 days to activate Windows XP, and after this grace period the system won’t be usable anymore and you’ll be forced to activate. Activating the OS over the Internet is quite simple: in a few seconds your licence’s authenticity is checked and your copy of XP is unlocked. For users with no internet connection, it remains possible to activate Windows XP by phone. What if you change some hardware pieces or replace your computer? If you change a major component of your system like the processor or the graphics card, the activation wizard will most likely appear when you restart the computer and you’ll have to phone Microsoft (a toll free number) to activate the copy. If you replace your computer with a new one, you’ll also have to phone Microsoft. The Microsoft representative will ask why you need a new key and perform some elementary checking before giving you a key based on the machine ID. They can ask you questions that can be answered only if you have purchased the product (what is written on page 14 of the users’ guide) to make sure your copy is a legal one. I know many of you are against this activation system but this was the only answer Microsoft could provide when almost 80% of the installed versions of Windows are actually pirated or used in blatant violation of the license. I won’t lie or hide the truth - the activation is a real pain and waste of time - however the majority of PC users have to pay for a minority of bummers. That’s how things work out in life. Microsoft Windows XP is based on the acclaimed Windows 2000 core that has proven an unrivalled level of dependability and reliability since its availability. So basically we can say Windows XP is what Windows 3.1 was to Windows 3.0. The best evidence is the build number of Windows XP starts with 5.1 meaning XP is only a –minor- revision of Windows 2000 (at least if you consider the core). Microsoft Windows XP is a 32 bit operating system that doesn’t use a mixed 16-32 bit core like Windows 9x does (only to support old Windows 3.1 applications) providing the ultimate rock solid platform for home users and workstations. Windows XP isn’t based on MS-DOS anymore! With Windows Me, we have seen DOS had two feet in the ground, but with Windows XP MS-DOS is definitely dead. That’s the main reason why Microsoft Windows XP is a real revolution for Windows 9x users: the DOS deletion along with a full 32 bit core will provide them exceptional reliability they have been waiting for. Just like Windows 2000 the architecture of Windows XP offers a fully protected memory model. Each application runs in its own dedicated memory space that way if an application crashes the rest of the system isn’t affected since only the allocated memory space is reinitialized. Microsoft Windows XP is a real pre-emptive multitasking operating system letting users run several applications at the same time while ensuring a reliable system response. Windows XP core is much more protected than the one of Windows 2000, so essential system data isn't overwritten by drivers or software you'll install. Plus DLL are now stored side by side on the hard disk so each program will use its own DLLs. It ensures a widely enhanced reliability over Windows 2000. 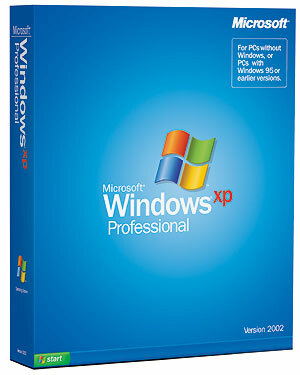 Microsoft Windows XP supports modest PCs as well as high-end workstations since the system is designed to run with multiprocessor configurations (two dual CPUs can be handled by the Professional version). It can also manage memory up to 4GB for the most exigent users. One of the main reproaches frequently addressed about computers is the fact they take an incredible long time to start. Most users have never been able to understand why their PC doesn’t behave like any consumer devices. Indeed, when you push the ‘on’ button of your TV you instantly get the image & sound, why with computers you have to wait several minutes before the system loads? This matter has been taken seriously by the Microsoft development team, and as a result Windows XP is probably the fastest booting OS of the world. Compared to previous Windows versions the boot time of Windows XP has been dramatically reduced. Before a regular system would take two minutes to load, now Windows XP will be loaded in less than 1 minute. Obviously those times depend on the configuration you have since SCSI cards and other devices which can lengthen those delays.